Daily Dose: Cornelius Boots, "Green Swampy Water"
Sometimes the right kind of soulful and soothing music can be downright magical, helping us wash our earthly troubles away, whisking the listener to an ethereal plain where we’re allowed to become mindful spectators of the neutral grace of nature. 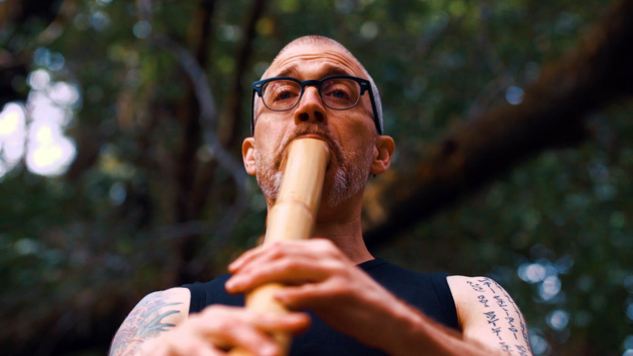 Sometimes this magic can take on a more literal form, as seen in the groovy and trippy music video for shakuhachi master Cornelius Boots’ new track—and natural anxiety demolisher—“Green Swampy Water.” Appropriate to the patience and calm associated with this bamboo wind instrument, once used as part of a blowing meditation by Zen Buddhist monks, the video takes its time establishing Cornelius’ journey into the North California wilderness. He’s accompanied by his trusty instrument, a thermos full of tea, and some sweet ‘70s nature drama-style credits. After some meticulous mental prep—which includes the longest and somehow most comforting pour of tea into a cup you’ll ever experience—Cornelius’ lips meet the bamboo. What follows can be quickly described as an Eastern take on the opening number of the original Fantasia—“Toccata Et Fugue” by Bach—where the sounds coming from the instrument is visualized with vibrant and exuberant colors performing an elegant dance with the nature that surrounds them. Director Andy Westhoff’s goal was to create a meditative yet exciting experience that makes the listener feel like they’re being swept up in magic via the power of music. An energy that is powerful enough to not only influence physical reality, but also the internal world of an individual. Westhoff’s main visual inspiration for the video was the 1988 George Lucas/Ron Howard fantasy classic Willow, but ardent cinephiles can also catch a slight nod to Akira Kurosawa’s Rashomon. So turn off the lights, very slowly pour yourself a cup of tea, and get lost in the magic of “Green Swampy Water.” Check out the video below. I was also fortunate enough to ask Cornelius Boots some quick questions about his music and his thoughts on the video. Paste: What’s your history and personal connection with shakuhachi? Cornelius Boots: In 2001, I was a professional rock, jazz and orchestral bass clarinetist and baritone saxophonist in Chicago. I’m not such a city person. I heard a recording of shakuhachi, met my teacher Grandmaster Michael Chikuzen Gould and have been hooked since: Now that’s all I perform and teach, and am a licensed shihan (master teacher) myself since 2013. The shakuhachi’s strong connections to nature and Zen are palpable in every note, every phrase. Some of us really crave that voice and soul of the primeval forest, the dark mysteries of the living ancient woods. In Japan, they really crystallized all that into this root-end bamboo, five-hole, no-mouthpiece vertical flute. Even though it’s almost impossible to play, eventually, the solo Buddhist repertoire leads you to a place where it completely opens up, and you can be a robust, endlessly creative music force on it, like John Coltrane might have done if he had lived long enough—he owned a shakuhachi and his last tour was in Japan. This is my path, because it’s the two strands of my lineage: the no-limits, virtuosic innovation of my jazz and rock ancestors—Eric Dolphy, Rahsaan Roland Kirk, Jimi Hendrix—and the depth and subtlety of the dynamic Zen style of my great-grand-teacher Watazumi. With some Black Sabbath and Sleep thrown in for grounding and balance. Paste: Walk us through your process of creating the song. Boots: As a woodwind player, the expansive, expressive freedom of real gospel and blues has always been both an inspiration and an impossible goal, even though we are also riding high on the virtuous power of the breath. This is partly because, instead of the easy fluidity or slidey-ness of the solo vocalist or the slide guitar, an instrument like saxophone is encumbered by keys and reeds, at the end of the day. It was originally designed for marching band, after all. Shakuhachi blasts those gates wide open because it has wildly variable tone production techniques, unbroken pitch sliding potential, and no keys at all. Perfect for accessing both that low down dirty blues and that ecstatic gospel reverence. In the case of “Green Swampy Water,” as well as most of the new repertoire I have created for solo shakuhachi and Taimu, it’s baritone brother—as catalogued on the recently completed Shakuhachi Unleashed trilogy of albums—all that devotion and emotion are directed back at the source: the natural, biological world. I call this playing style “bamboo gospel,” and it uses a handful of lost breathing techniques as well as this nature ethic and cross-cultural music pollination. Paste: What are your thoughts on the video?